Lenders now won't be able to charge more than 0.8% interest per day, but that won't stop demand for loans. 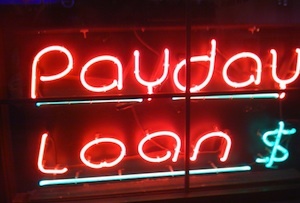 The Financial Conduct Authority (FCA) announced its long-awaited plans to crack down on controversial payday lenders today, leading to claims that consumers could be driven into the arms of illegal loan sharks. From January 2nd lenders will not be able to charge more than 0.8% per day in interest and fees for defaulting cannot be higher than £15. The FCA says a total cost cap of 100% will protect borrowers from escalating debts. 'I am confident that the new rules strike the right balance for firms and consumers,’ said Martin Wheatley, the FCA's chief executive officer, adding that if the cap were any lower there would be a risk of payday loans not being viable at all. The FCA estimates that 7% of current borrowers might not have access to payday loans as a results – the equivalent of 70,000 people. It insists that these people would probably be better off without a loan, but the Consumer Finance Association, which represents payday lenders, says that cap or not, the demand will still be there. What’s certain is the cap will not dampen Britain’s insatiable appetite for debt. Official figures show household debt relative to income has fallen since the financial crisis, but this masks a class divide. As ITV’s economics editor Ed Conway has pointed out, the numbers largely reflect changes in the mortgage market, which has obviously taken a massive hit since 2008. ‘Britain’s shadow finance market is booming, whether that means purchase agreements, asset finance or payday loans,’ Conway wrote in the Times. ‘QE is one reason: for many lenders, money is cheaper than ever. The FCA can regulate all it likes but desperate and deeply ingrained consumer behaviour is unlikely to be shaken by tinkering around the edges.